Living just a few blocks away from Cedar Point always makes it an attractive possibility when we’re trying to decide where to go—but for us to go there often would require it to be an extra step above the rest, since Fishtown has quite the selection of top-notch gastropubs to choose from. Where Cedar Point excels, though, is the cozy interior that doesn’t resemble a 1970s rowhouse, a regular menu that’s over half vegan/vegetarian, and one of the better outdoor eating spaces in the area. Our attendance has been like an inverted bell curve, as the kitchen seemed to start strong when they opened, and then hit a mild skid after a while. They are back up to par, though, and it’s been quite a while since we’ve been disappointed by anything we’ve ordered. And, over the course of the last two years, my wife and I have ordered plenty. It doesn’t hurt that the beer program is always solid and there is always a nice mix of classic and interesting original cocktails to be sipped on above-mentioned outdoor deck. The team from former No Libs favorite A Full Plate Café have put together something nice here, with an atmosphere that can be labelled “something for everybody” more accurately than almost anywhere else. VEGGIE WINGS – This is one of our PHL Favorites! Click here. 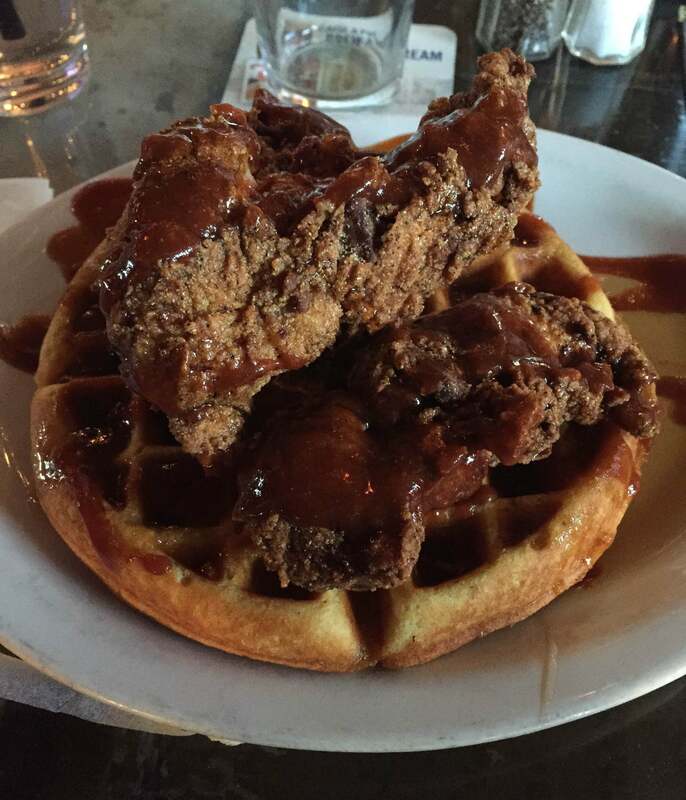 FRIED CHICKEN & WAFFLE – If there is a better chicken and waffle in the city, someone please tell me about it, because I haven’t been able to find it on my own. Boneless chicken tenders (which should be a requirement for chicken & waffle) stacked on top of a thick cornbread waffle with a BBQ syrup that is the perfect mixtures of sweet and savory. This hits ALL the receptors. CATFISH PO BOY – I’ve had my fair share of sandwiches at CPBK, but for some reason keep going back to the catfish po boy, despite finding the roll a bit too thick for the sandwich. There is something about the mixture of shredded romaine, pickles, and remoulade that makes everything so bright and offsets the fried catfish perfectly. And speaking of fried catfish, let this one sit for a few minutes when it comes out lest you melt your tongue. DISCO BISCUITS & GRAVY (Brunch only) – Hoo boy. If you need something to fill up on to kill a hangover, this is it. Vegan sausage stuffed inside two house-made biscuits, which are then covered in white onion gravy. Included are a side of breakfast potatoes, and you can add some fried eggs for an extra $2, which should be a requirement rather than an option. This entry was posted on May 28, 2015 by Ryan in PHL Favorite, Review, Sandwiches and tagged cedar point, cedar point bar and kitchen, chicken and waffle, fishtown.